These have a charming domed-shape habit, like a little round pillow. They may be very low to the ground (sometimes called a “bun”) or they may be a little taller in habit. Flower stems might be taller than the foliage (like with some kinds of Dianthus) or the flowers may rest basically on the top of the plant. Cushions are sometimes evergreen and sometimes they die back over the winter, depending on the plant. If they make numerous stems at the base, then it’s possible to carefully divide them in the spring to make more plants. Some kinds of cushions have essentially just one main stem, and these types must be increased by cuttings or sometimes by seed. Take advantage of the charming cushion shape and feature it as a specimen, surrounded by low, carpeting plants or even just by gravel mulch. Cushions may also be grouped, but have a tendency to then look like a clutch of hedgehogs laying side-by-side, which is still interesting! Many cushion plants grow well in crevices between rocks, growing up and outward over the rocks. They can look charming in a wall, but they don’t really cascade or creep along the cracks. Cushions are wonderful in troughs and containers, because they look so cute. 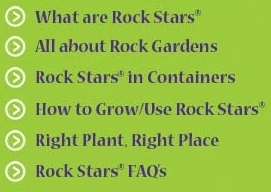 To see different Rock Stars® with a cushioned habit, try using our Advanced Search to locate them quickly and easily.